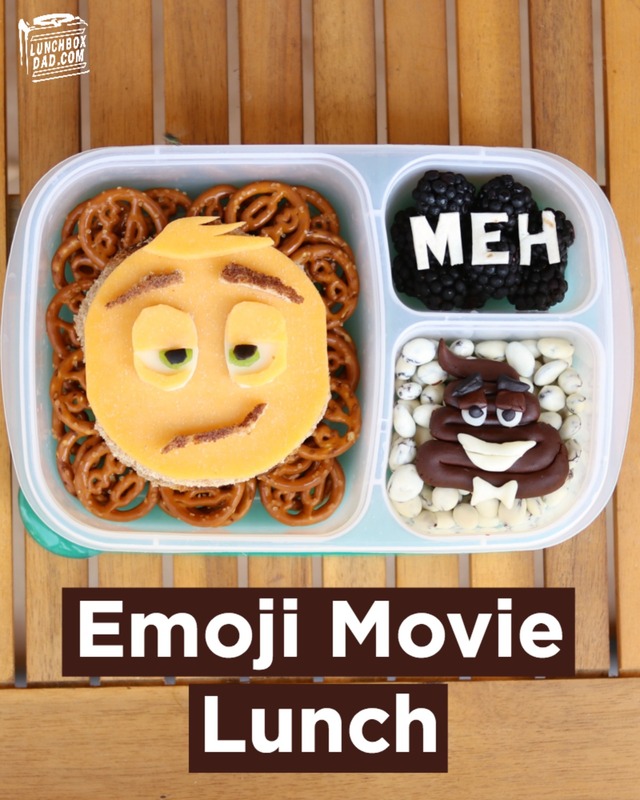 I can't believe that I'm about to say this but the lunch today is the second emoji lunch I have made. I hate emojis, but I love my kids. In fact, I firmly believe that every time I have to use an emoji on social media, a piece of my soul dies. Is this a little overdramatic? Maybe. Or maybe not. Maybe I'm just Meh about the whole thing. So a little while back we took our kids to go see The Emoji Movie. My kids were begging to see it and it was pretty much the only kids movie in the theatre at the time. 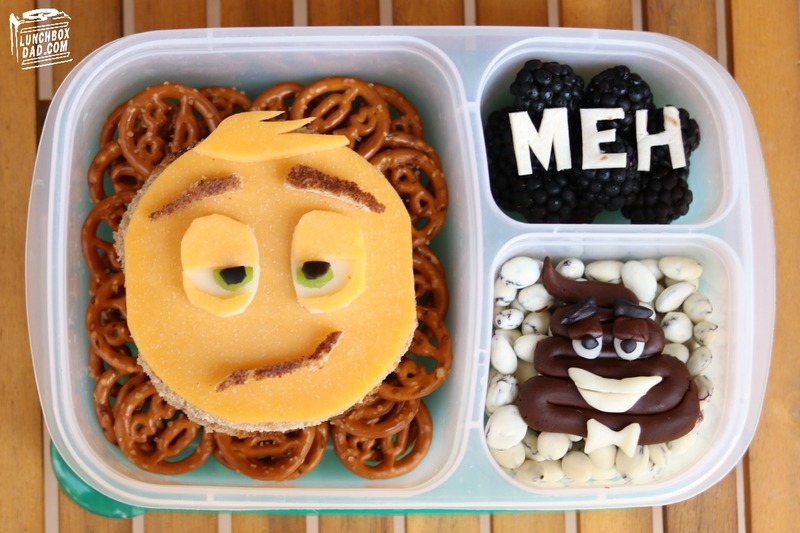 They thought it was hilarious, so now that school is back in session, I thought I would make this lunch to help them smile during their lunch break. This should be proof that the lunches I make them are for their enjoyment! Anyway, if your kids are into The Emoji Movie, then this would be fun to make for them! Ingredients: Cheddar Cheese, whole wheat bread slice, provolone cheese, snap peas, black olive, lunch meat, pretzels, blackberries, tortilla, yogurt covered raisins, black, brown, and white fondant. 1. Cut bread slices and cheddar cheese into a circular shape. I used a cookie cutter to make it easy. Cut the other facial features from cheddar and provolone cheese. Cut the green and black parts of the eyes from a snap pea and olive. Use bread crust for the mouth and eyebrows. Put your child's favorite lunchmeat in the middle of the bread and the cheese face on top. 2. Drop emoji shaped pretzels in the main compartment and put sandwich on top. 3. In side compartment place blackberries. Cut "Meh" out of tortilla and put it on top. 4. 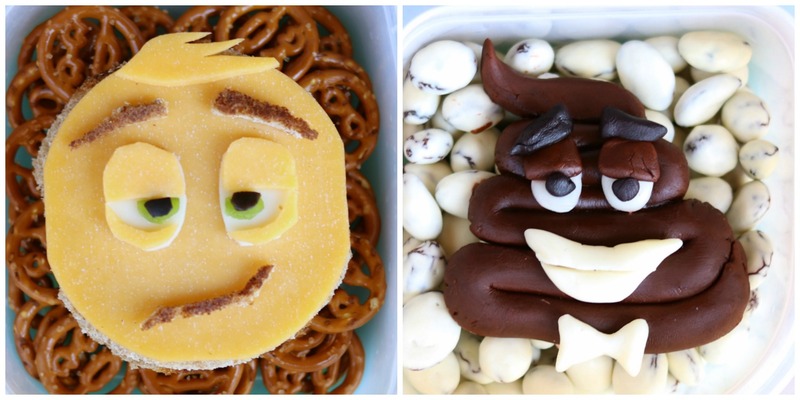 Form poop emoji out of brown, black, and white fondant. It works just like clay. Drop yogurt covered raisins in second side compartment and place poop emoji on top.